Summary: The animation works on a small screen well, and, overall, it’s best watched as a simple Star Wars pleasure than taken seriously as attempting to flesh out what happens between Episodes II and III. Once a legendary trilogy of movies, the Star Wars universe has been increasingly expanded in recent years by creator George Lucas with varied results. His prequels failed to live up to their predecessors while The Clone Wars period of his tale was spawned into a computer-generated television series and feature movie. Aimed squarely at his younger fans, The Clone Wars film suffered at the box office as the older generation complained of Lucas dumbing down or cashing in with a cheap addition. The four episodes here taken from the small screen series are far more successful as the 20 minute bite size portions of Star Wars action are more in-keeping with an easy-to-view cartoon which the youthful audience will appreciate. You may think this era in the Star Wars mythology has already been covered in animated form, and you’d be right. In 2003 Genndy Tartakovsky, the creator of Samurai Jack and Dexter’s Laboratory, covered similar ground with his hyper-stylised 2-D animation. This series uses 3-D CGI to reproduce the likeness of heroes including Anakin Skywalker, Obi-wan Kenobi and Yoda in a more serious approach to proceedings the Grand Army of the Republic fights the New Droid Army of the Separatists. Collected here are four episodes in the series, including a three-parter with echoes of the iconic Death Star weapon. First up is “Ambush” which sees Yoda and a trio of clone troopers up against the odds when Count Dooku’s villainous assassin Asajj Ventress pins them down on a planet with a huge droid presence. Yoda gets to dish out his hyperactive fighting moves as well as valuable advice to his posse of clones in a straightforward story of having the confidence to succeed with the usual array of droid attackers seen in the prequels. The other three episodes see General Grievous take command of a Separatist warship, Malevolence, with an ion cannon which will disable all spaceships in its blast area. The threat this ship poses to the Republic is spoken of in a tone very similar to the discussions the Death Star, although it is far less powerful, and the firing of the cannon features a shot with a nod to Episode IV. 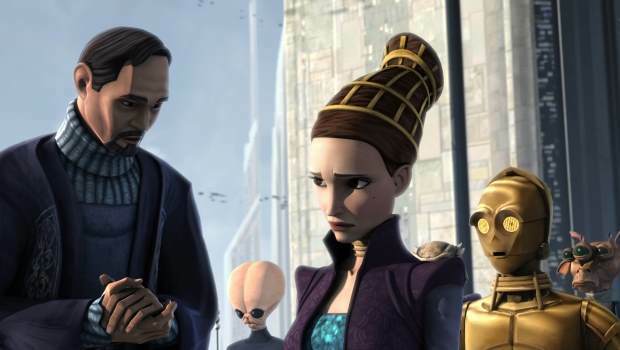 Anakin, Obi-wan, Princess Amidala and Plo Koon all feature, so there are plenty of recognisable faces, although there are few surprises to a simple plot which is stretched out to almost an hour with characters talking more about what they want or need to do than taking the necessary action. This first release for Star Wars: The Clone Wars is geared more towards space battles than light saberduels duels or Jedi powers in full force beyond Yoda’s exploits which was never the strongest element of the series. There are few of the political power struggles and no revelations about characters here, it’s all pretty standard fare as is to be expected with a spin-off television series aimed at a younger audience. The animation works on a small screen well, and, overall, it’s best watched as a simple Star Wars pleasure than taken seriously as attempting to flesh out what happens between Episodes II and III.